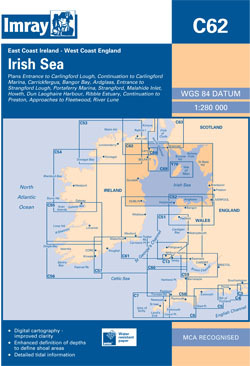 The northern part of the Irish Sea, from Dublin and Liverpool to Belfast Lough and Stranraer. Scale: 1 : 280.000. Five and two-minute gridlines. Larger scale plans of Entrance to Carlingford Lough, Portavogie, Skerries bay, Kilkeel harbour, Malahide Inlet, Ardglass, and Entrance to Strangford Lough. Tidal stream diagrams. On this 2014 edition the latest wind farm developments are shown off the coast of England and Wales. Changes to depths from recent surveys are included, particularly at Belfast Lough, Ardglass, Howth, Dun Laoghaire Harbour and the approaches to Morecombe Bay.